To many, cut is the most important of the 4 C’s. 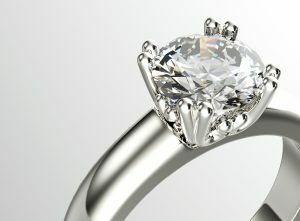 Each diamond is cut using an exact formula that unleashes its brilliance and fire. Internal imperfections and external irregularities affect the clarity of the diamond by interfering with the passage of light through the stone. The diamond is more valuable when it has fewer inclusions. Some people believe that carat refers to the size of the diamond while in actuality, carat is the term used to measure the diamond’s weight. Because larger diamonds are more rare, they generally have a greater value per carat. While diamonds come in every color of the spectrum, the most valuable diamond color is colorless. Truly colorless diamonds are extremely rare and as a result are more expensive. Establish a budget. Understand the 4C’s. One of the most wonderful lures of diamonds is that no two diamonds can ever be exactly alike, even though they may sometimes look identical. It is important to select the finest quality stone available at that price. Look at her existing jewelry wardrobe. It will give you a lot of hints about her personal style. Is she traditional or non traditional? When in doubt, find a trustworthy friend who knows her style. To get the size right, sneak a ring that you know fits her ring finger. Press it into a soft bar of soap, leaving an indent for the jeweler to determine a size from. 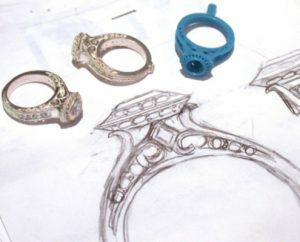 Shop with a reputable jeweler such as Birgit’s Jewelers. At the end of the day, where you shop is the most important factor. Shop with a jeweler you trust. Make note of the exchange or return policy. If she would still prefer a different ring, you will need to make sure you can exchange it. Fine jewelry is meant to be worn and passed down to future generations but proper care is required to assure the lasting qualities of your investments. Dust, pollution and daily wear contribute to dulling. Extreme temperatures, perfumes, cosmetics, ultrasonic cleaning and household chemicals can also damage them. Worn prongs and broken clasps can result in the loss of a stone or an entire piece. Taking simple steps to care for and clean your jewelry today, will help ensure that it will remain looking beautiful tomorrow. Remove all jewelry before showering or cleaning. Soap can cause a film to form, making it appear dull and dingy. Apply all lotions, cosmetics, perfumes and colognes before putting on jewelry. You should remove your jewelry before entering a chlorinated pool or hot tub. Keep your diamonds, gemstones and gold away from chlorine bleach and other household chemicals as it can damage and discolor them. You should also remove all jewelry before entering salt water as it can have similar effects. Take care to protect your jewelry from impact and avoid contact with abrasive surfaces, such as when gardening. Even a diamond can chip if hit with enough force or at just the right angle. Gemstones can also scratch other gemstones and wear away at precious metals. Avoid stacking rings and bracelets that would be vulnerable. Make sure to wipe your jewelry with a clean, soft, slightly damp cloth after wear to remove any chemicals, oils or perspiration. Keep your jewelry in a soft pouch, fabric-lined jewelry case, or in a box with compartments and dividers when not worn. Almost all jewelry can be safely cleaned using a mild soap and water solution or a mild solution of six parts water to one part ammonia. Use a soft brush, such as a toothbrush, to gently clean your items. If there is a heavy tarnish on your jewelry, consult your jeweler for the best cleaning procedure. After the brushing, simply rinse with lukewarm water and allow to dry. Always lay cultured pearl strands flat. Hanging a strand may stretch the threads. Avoid touching your clean diamonds with your fingers. Handle all fine jewelry by its edges after it has been cleaned. We recommend the you bring in your jewelry every six months for a professional cleaning.